Huge uplifting tune for the weekend this one, due out on Tiesto’s Musical Freedom label on April 24th. This is the duo’s first remix together since ‘Zero 76’ and what a tune it is! They’ve taken indie band’s The Naked And Famous’ track ‘Young Blood’ and turned it into a massive, melodic, slab of dance music that they’ve both been road-testing since before this year’s Miami. This works so well, the rock vocals of TNAF are beautiful and their appeal will certainly gain a new fan base as dance music fans scramble to get this. It should easily see a crossover in the dance and indie community due to all artists’ popularity. 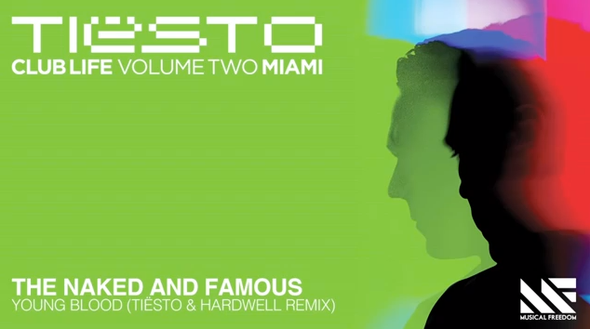 The remix will be released on Tiesto's new mix compilation ‘Club Life - Vol. 2 Miami’, which is out today in mainland Europe, April 23rd in the UK and rest of the world, and April 24th in the US and Canada. Have a listen below, if this doesn’t get you pumped up for the weekend, then shame on you!